This review is of the English-dubbed version shown as part of the KINOTEKA Polish Film Festival in April 2019 – the UK release date is currently unknown. One of the many perks of being in the movie reviewing business is that you sometimes get to go to exclusive screenings of movies that you normally would never have bothered seeking out otherwise. I have nothing against Polish cinema, I just don’t really have as much willpower to actively try and see them, unless they’re gaining some kind of buzz like Cold War did, or are ones that look really, eye-catchingly interesting. So, when I was given the opportunity to go to the opening gala of the KINOTEKA Polish Film Festival, for a film called Another Day of Life, I’ll admit that I didn’t have much of an idea about what it was about, but as soon as I read up a little more about it, my movie senses began tingling, and found myself seated with a couple of work friends for a movie just days earlier I had never even heard of. I have no idea if it’s going to be distributed to UK cinemas following its initial festival run, but I hope so; this is a fascinating, visually stunning and insightful tribute to a guy who led a very dangerous life, but always combatted the several dangers he faced with professionalism and firmly-fisted dedication. Told partly in animated reconstruction, and partly in live-action documentary footage, the film follows Polish journalist Ryszard Kapuscinski (voiced in the English dub by Kerry Shale) who’s stationed in Angola during a very complicated period of the Cold War in 1975: the African nation is at war with itself following its independence from Portugal, and two former liberation movements – the Soviet-backed MPLA and the US-backed UNITA – are struggling for power in the region, often resorting to extreme genocide in their ongoing clashes. During all of this, Kapuscinski is determined to find the facts and report them back to Poland, and over the course of a few months travels up and down the country, meeting several figures of the Civil War and seeing an even uglier side to all the carnage. Throughout, the film cuts back and forth to several interviews with some of the real-life people that Kapuscinski encounters during the animated segments, who tell their side of the story whilst with the reporter in many of the dangerous, and even deadly, situations. My interested was piqued by its intriguing style of animation, which made me recall the similar style used for the 2008 animated documentary Waltz with Bashir, a movie that I greatly admired when I first saw it back then. It’s a familiar, but not entirely identical, style they’ve gone for here, a sort of rotoscoping job that looks like sketches which have come to life; I knew this was based on a book, but watching it I was wondering if it was a graphic novel due to its very stylised visuals (to clarify: it isn’t, but I’m sure it’s still worth a read regardless). Either way, it’s a fascinating stylistic choice that really paves the way for some haunting imagery to take place on the screen, with some very surreal designs and disturbing connections to the harsh realities that the real Kapuscinski must have experienced. It is breathtaking to watch, not just as a study of blended 2D/3D animation, but as an introduction to a side of history that many people may not be too familiar with; we get so caught up in the biggest events of the Cold War that we tend to forget that there was other stuff happening around the world in more places than just Vietnam or Cuba, and at the very least this film serves as a strong introductory platform to a much smaller, but no less significant event that helped shaped a country’s future. There are times, though, when you wonder which side of the war this movie favours the most, as for a lot of it there seems to be a heavier fixation on the accomplishments and figures of the MPLA (which – spoiler alert – would end up being victorious in the Civil War 27 years later, in 2002), the faction that supported Communism and was backed by a regime known for its ruthlessness, with the Capitalist-backed UNITA barely getting much attention. The thing to remember is, this isn’t a film about the Angolan Civil War as a whole; it’s much more about the experiences that this one guy experienced first-hand, and later shared in his book that would go on to inspire this film. In that regard, don’t go in expecting the definitive cinematic essay on the subject, but go in with the idea that you’re seeing a beautifully made and highly ambitious love letter to a guy who loved doing what he was paid to do, and you’ll be just fine. There are other things about the movie that don’t always gel, such as some of the voice acting being a little hokey and unnatural, but even then I can chalk that down to this particular dub; it’s the same with any piece of animation from a foreign country that’s dubbed by English actors, with not all of it coming across as naturally as it probably does in its native language. Overall, this is a very strong movie that certainly surprised me in ways that go beyond even existing; it’s a thoughtful, gorgeous and fascinating movie that I do hope gets a wider release sooner rather than later. 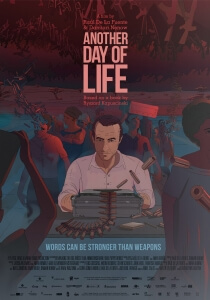 Another Day of Life is a fascinating look at Polish reporter Ryszard Kapuscinski’s time in Angola during the country’s civil war, mixing some compelling live-action footage with stunning animated segments that are ambitiously surreal in their imagery but also gorgeous to look at.